Thursday, December 4, 7:30 p.m.
For beginners overwhelmed by too many choices as well as seasoned professionals eager to improve their game, The Art of Social Media is full of tactics that have been proven to work in the real world. Or as Guy puts it, “great stuff, no fluff.” Guy Kawasaki is the chief evangelist of Canva, an online design service, and an executive fellow of the Haas School of Business at U.C. Berkeley. Previously, he was the chief evangelist of Apple and special advisor to the CEO of the Motorola business unit of Google. His many acclaimed books include The Art of the Start and Enchantment. Peg Fitzpatrick is a social media strategist innovating the world of social media. She’s spearheaded successful social-media campaigns for Motorola, Google, Audi, Canva, and Virgin. Come learn about the ins and outs of self-publishing with Silicon Valley venture capitalist, entrepreneur, and bestselling author, Guy Kawasaki. In 2011 the publisher of Guy's book, Enchantment, could not fill an order for 500 ebook copies. Because of this experience, he self-published his next book, What the Plus!, and learned first-hand that self-publishing is a complex, confusing, and idiosyncratic process. With Shawn Welch, a tech wizard, Guy wrote APE to help people take control of their writing careers by publishing their books. The thesis of APE is simple but powerful: a successful self-publisher must fill three roles: Author, Publisher, and Entrepreneur. Saturday, March 2, 12:00 - 3:00 p.m.
See what's new in e-books for adults and kids! Get one-on-one demos and learn how to download and read thousands of e-books -- and e-audio books -- from the library onto your mobile device or laptop. Learn about lots of other great sources for e-books (many of them free) like Kobo, Amazon, Google, and the Internet Archive. Win a Kindle! Two lucky people who attend the event will win a brand new Kindle, courtesy of the Menlo Park Library Foundation. Featured speaker, 12-1pm: Popular author and Silicon Valley legend Guy Kawasaki will speak about his latest book, APE: Author, Publisher, Entrepreneur! and how to publish your own e-book. Mr. Kawasaki will be happy to sign copies of the book, provided by Kepler's, at the end of his talk. Guy Kawasaki is currently considered a "single author." If one or more works are by a distinct, homonymous authors, go ahead and split the author. 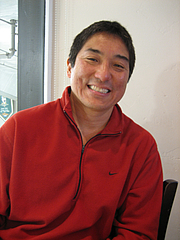 Guy Kawasaki is composed of 4 names. You can examine and separate out names.